FOREX: Expectations that the Fed will continue to signal further monetary tightening when it keeps rates steady at the conclusion of the FOMC meeting later today probably helped the dollar index to move higher by 0.22% as the market took a breath after the US midterm elections. Dollar/yen traded up by 0.13% at 113.66, near one-month highs. Meanwhile in the Eurozone, the European Commission revised the bloc’s economic growth for 2019 downwards to 1.9% y/y from 2.0% before, and projected further growth weakness in the next two years as expected. Separately, forecasts for the Italian deficit indicated that the Eurozone and Italian views on this matter are divided as Brussels anticipates the Italian deficit to surpass 3.0% in 2020, whereas the Italian government pledged to keep it below 2.4%. The European Commissioner, Pierre Moscovici said that he is still expecting a revised Italian budget by November 13. 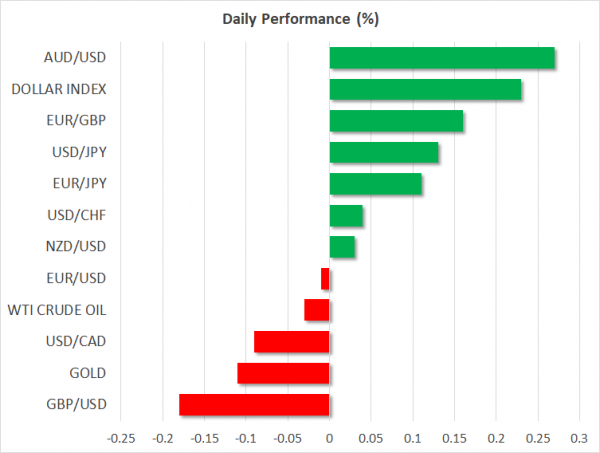 Euro/dollar was moving sideways around 1.1422, while euro/yen and euro/pound were up by 0.13%. Pound/dollar inched below 1.3100 after reports that a Cabinet meeting in which the UK PM will try to unite ministers on the Brexit front is unlikely to take place this week, with the pair losing 0.16% in the day. Pound/yen reached a new one-month high at 148.49 but it soon reversed below it to settle near opening levels. The antipodean currencies were in positive terittory, with aussie/dollar and kiwi/dollar gaining 0.33% and 0.06% respectively. Dollar/loonie eased slightly below the 1.3100 handle (-0.11%). STOCKS: European stock indices were mixed at 1200 GMT. The pan-European STOXX 600 and the blue-chip Euro STOXX 50 were trading higher by 0.25% and 0.30% respectively. The German DAX 30 retreated by 0.17% led by losses in the healthcare sector, while the French CAC 40 and the Spanish IBEX 35 were flat. The British FTSE 100 rose 0.30%, whereas the Italian FTSE MIB declined by 0.62%. US stocks skyrocketed yesterday, however, futures tracking the major indices were flashing red today, pointing to a negative open. COMMODITIES: Oil prices moved south, with West Texas Intermediate crude turning flat in the day at $61.66/barrel and the London-based Brent falling by 0.24% to $71.90. The yellow metal was weaker by 0.08% on the back of a stronger dollar as investors digested the US midterm elections results and turned their attention to the Federal Reserve meeting later today. Later on Thursday, the Federal Open Market Committee will conclude its two-day policy meeting, with the rate announcement scheduled for release at 1900 GMT. Policymakers are expected to stay on course and leave borrowing costs unchanged this time at 2.00% – 2.25%, while in December they are projected to deliver the fourth-rate hike for this year. Even though the gathering might prove uneventful as no press conference or new economic projections are on the agenda, investors will carefully read the statement to identify any tweaks in the language and rate guidance for 2019 given the recent sell-off in stock markets but the still-robust economic figures . In case the rate statement takes a surprisingly amore hawkish point of view than previously, then the dollar may gain more, and vice versa. Note that this will be the last meeting without a press conference as the Fed chief Jerome Powell plans to start holding a press conference for each of the eight meetings set every year from 2019 onwards. 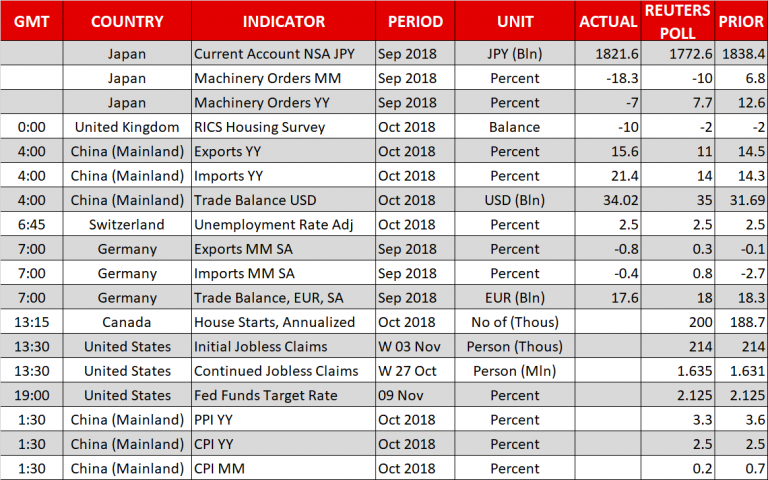 Following the FOMC rate decision, the focus will shift to China where the National Bureau of Statistics will update its Consumer and Producer price indices. Forecasts suggest that year-on-year, consumer prices grew at the September’s pace of 2.5% in October, the highest since March, while on a monthly basis, the measure slowed down from 0.7% to 0.2%. The Producer Price Index is also anticipated to lose strength for the fourth consecutive month, falling by 0.3 percentage points to 3.3% y/y in October. While the People’s Bank of China aims to stand pat on monetary policy despite rising uncertainties in US-Sino trade relations, a beat in the data might provide additional tailwinds to the Chinese yuan as well as to the Australian currency since China is Australia’s top export partner. Recall that Chinese exports and imports increased much faster than analysts projected, driving country’s trade surplus to 34 billion US dollars, the biggest mark printed since July. 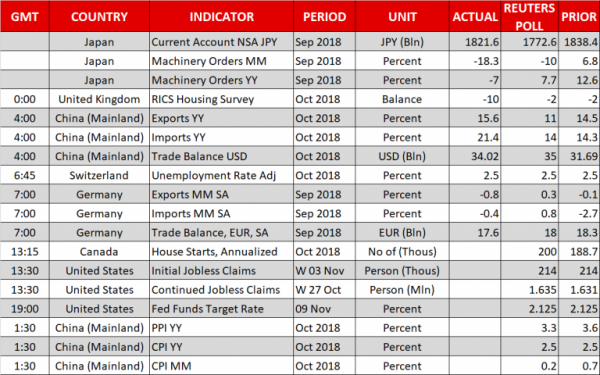 In other data of interest, US initial jobless claims for the week ending November 3 will be available for review at 1330 GMT, while earlier at 1315 GMT Canada will be publishing readings on housing starts. Although interesting, both measures are usually not market movers. Overnight in Australia, traders will be waiting for the RBA monetary policy statement accompanied with new quarterly economic projections to come out at 0030 GMT. A more confident RBA on the back of a stronger GDP growth in Q2 and positive developments in the labor market may add sparkle to the aussie. Recall that on Tuesday the Bank decided to hold interest rates unchanged at record lows, with markets looking forward to hearing whether policymakers continue to see the next move in rates to be up. On the political front, Brexit will continue to keep traders busy as a row of headlines have been supporting that a solution is drawing nearer in the past couple of days, making it appear increasingly realistic. Yet as the story lacks sufficient detail, investors are likely to hold some cautiousness until they get a clear picture on the issue. Pressure is now on the British Prime Minister, Theresa May, who will push hard to persuade the Cabinet to accept her Brexit offer probably next week, after a failed attempt on Tuesday. As for today’s public appearances, ECB board member Benoit Coeure will be delivering a keynote speech regarding the role of central banks at 1415 GMT in Berlin, while in Stuttgart, ECB governing councilmember Ewald Nowotny is set to speak at 1600 GMT. ECB chief, Mario Draghi will be giving introductory remarks during his exchange of views with the House of Representatives in Dublin at 1520 GMT.